Nestled in the Pines Your Log Home Awaits...Bring the Chickens, Bring the Horses!! If you have Dreamed About Living in the Country to Have Animals, This is the HOME for You! 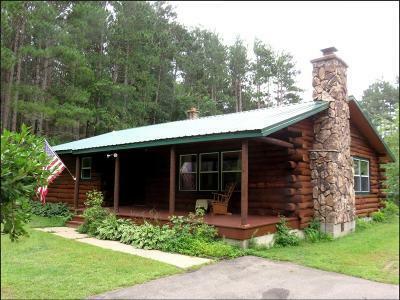 This 3 bed, Full Bath LOG Home is Perfectly Secluded and Tucked into 60' Towering Pines! You Will Not Be Disappointed in the 5 Acres of Peace, Tranquility and Room to Roam! The 2 Car Detached Garage Provides Tons of Storage For All Your Recreational Necessities! Enjoy All the City Conveniences, Which are Just a Short Drive Away! This Home is a Bow Hunters Paradise with Wildlife Everywhere. Owners Love the Quiet Road & Privacy, Close to Town and Snowmobile Trails for the Active Outdoor Lovers. New Metal Roof 2018, Central Air 2016, Freshly Sealed Logs, Blacktop/Carpet LR/Flooring Allowance $3000. Low Taxes.